Fashion month is well and truly under way and already designers are being criticised for using models that are practically skin and bone. Whilst critics and experts within the industry are applauding the collections, the public have issues with the girls wearing the clothes. We're constantly bombarded with tips from magazines on how to lose weight quicker and how to hide our imperfections without them knowing anything about us as the reader, much less our appearance. This is just one example of body shaming, and it's not just in magazines, it's everywhere. 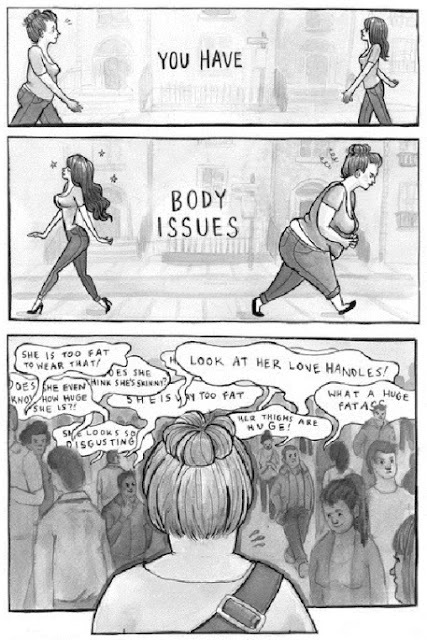 Body shaming has become the norm; to judge and criticise not only ourselves but each other. It's become a vicious cycle. Messages from the media are constantly telling us that we should change the way we look and we should care that we're not skinner, prettier, taller, the list is endless. Body shaming comes in different forms; criticising your own appearance in comparison to anothers, criticising another's appearance in front of them and without their knowledge. No matter what we're bound to compare ourselves to others and most commonly those in the limelight and the models that grace the covers of fashion magazines around the world. Within the fashion industry it appears that in order to be successful you must be thin. Certain designers have come under fire for sending 'emaciated' models down the catwalks and sending the wrong message to not just young girls but everyone. We're all aware of the damages that these images and messages can be towards body confidence, yet there seems to be little change. One country that has finally taken matters into their own hands is France. When it comes to the use of ultra-skinny models, those that continue to use dangerously thin models can now face fines and even up to six months in jail. But it's not only skinny shaming that takes place but also fat shaming. Yet more and more plus-size models have come into the mainstream working with brands such as Marks and Spencer, Dolce & Gabbana and even gracing the cover of Sports Illustrated swimwear edition. Perceptions towards body image and confidence, no matter what the size, are always going to be a hot topic and an ongoing issue throughout the world. But what we need to remember is that everyone is different and we need to empower each other and celebrate all forms of size, shape and colour.